Larry Bacow is one of the most accomplished, admired, insightful, and effective leaders in American higher education. This is a pivotal moment for higher education—one full of extraordinary possibilities to pursue new knowledge, enhance education, and serve society, but also a time when the singular value of higher education and university research has too often been challenged and called into doubt. Such a time calls for skillful leadership, strategic thinking, and disciplined execution. Larry will provide just that. He will bring to the task not only wide experience, deep expertise, and an intimate familiarity with Harvard’s opportunities and challenges, but also a passionate commitment to helping universities, and everyone within them, serve the larger world. He is ideally positioned to hit the ground running and keep Harvard moving ambitiously forward. The Harvard I have known has always stood for at least three things: the pursuit of truth, or as we say, Veritas; an unwavering commitment to excellence; but also to opportunity. In a nation divided, these guiding ideals have never been more important. We should never shy away from nor be apologetic about affirming our commitment to making the world a better place through our teaching, through our scholarship, but also to our commitment to a search for truth, a commitment to excellence, as well as a commitment to opportunity for all. In one sense, Bacow did not need much of an introduction: a seasoned hand in higher education, at Harvard and within Greater Boston, he has referred to his “Red Line” career along the MBTA subway from Kendall Square (MIT) to Harvard Square and then back to MIT, up to Davis Square (Tufts), and now back to Harvard. After completing his bachelor’s degree in economics at MIT (in three years), Bacow earned three more a couple of miles up Massachusetts Avenue; returned to MIT for a distinguished 24-year career on the faculty, where he was Martin professor of environmental studies, chair of the faculty, and, ultimately, chancellor; decamped all of half a dozen miles to Medford, where he had an accomplished record as president of Tufts University from 2001 through 2011; and then made homes at Harvard’s Graduate School of Education and Kennedy School of Government—respectively, as president-in-residence and leader-in-residence, advising other higher-education leaders, teaching in executive-education classes, and writing about an array of education issues. Not trivially, he was elected a member of the restructured, expanded Corporation in 2011. From the summer through late last year, as we reached out widely to solicit advice and nominations, increasingly many people within Harvard and beyond—faculty, students, staff, alumni, institutional leaders here and elsewhere—encouraged us to consider Larry for the presidency. We ultimately decided to ask him if he would consider becoming a candidate. After pondering the request, he agreed to step down from the search committee in mid-December. In doing so, he emphasized his deep belief in the University’s mission and values and his desire to do everything he can to enable Harvard to be the best it can be. It merits recalling the discontinuities that attended Faust’s selection.The turbulent presidency of Lawrence H. Summers had been cut short by his departure in 2006. Derek Bok returned to Massachusetts Hall to lead the University for a year, calming matters in the interim. Then came the promise of a new presidency, with a daunting agenda: restoring a sense of collegial community; replenishing decanal and senior administrative ranks; and beginning to plan in earnest for a delayed, pressing capital campaign. Faust came to the task after a half-dozen years as founding dean of the Radcliffe Institute: a solid place from which to gain a broad understanding of Harvard, to be sure, but on a much smaller scale than the University itself (and without the complications of leading multiple faculties and thousands of students). I am truly honored and humbled by this opportunity to succeed my good friend and colleague and somebody who I admire greatly, Drew Faust, and also to have a chance to follow in the footsteps of some wonderful leaders that Harvard has enjoyed. Neil [Rudenstine], it’s an honor to have you here today. On several substantive matters, he firmly embraced the path established by the administration and Corporation—on which he and Faust, of course, have been colleagues. Allston development. As past chair of the governing board’s committee on facilities and capital planning, and chair of its finance committee, Bacow has had ample opportunity to engage with Harvard’s ambitious plans for physical growth in the community abutting Harvard Business School. His scholarly work on environmental policy and dispute resolution, negotiation, economics, and land use and development surely provided an especially solid foundation for that work. One Harvard. With “every tub on its own bottom,” Harvard has historically, and famously, been a decentralized university, where deans exercise academic and fiscal clout. As the institution has progressively directed physical growth and fundraising in a coordinated, central way, presidents have sought a larger presence, and have played a more visible role, in determining both. And as intellecctual challenges and opportunities have arisen across departmental, disciplinary, and even school lines, presidents since Rudenstine have explicitly encouraged interfaculty initiatives, sought to foster new intellectual collaborations, and pushed to make logistical obstacles (uncoordinated academic calendars, for example, or rigidities in teaching arrangements or appointments) less formidable and boundaries more permeable. Under Faust, that theme has coalesced as “One Harvard,” to the point that bringing existing, but scattered, expertise and capacities together has often seemed as important as adding to the professoriate—or even more so. An experienced hand. 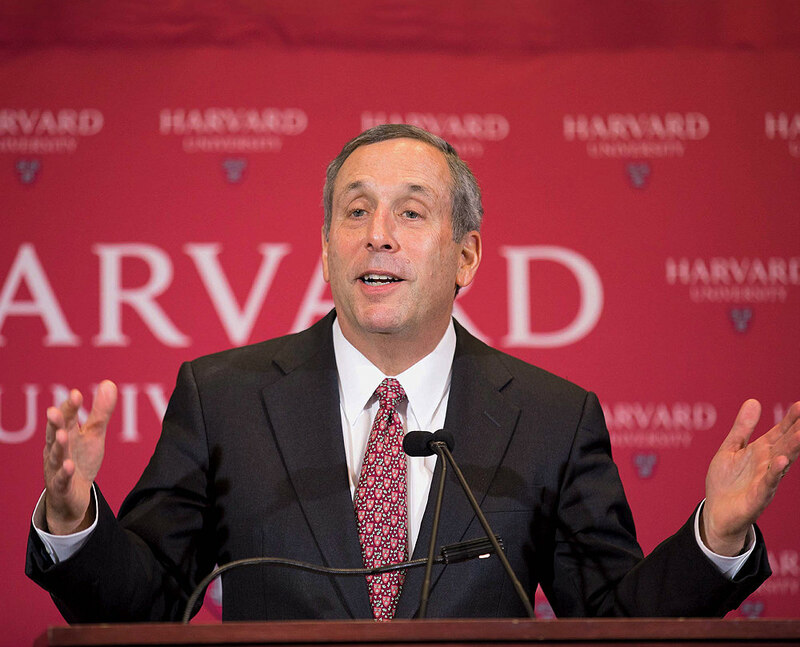 Beyond his understanding of Harvard’s priorities and alignment with its trajectory, Bacow brings to the presidency broad experience in university management and leadership. Based on his record, he has very much walked the walk. During his decade at Tufts, where he had far fewer resources to work with—the endowment now is $1.8 billion, one-twentieth Harvard’s (of course, the institutions differ significantly)—he championed need-based financial aid; directed new resources to the aid budget, replacing loans with grants for low-income undergraduates; realized a significant increase in sponsored research; managed the relationship with the university medical center; and conducted a record capital campaign. As Tufts president, Bacow was a higher-education leader, building a coalition focused on colleges’ and universities’ civic role and social responsibilities. He was chair of the council of presidents of the Association of Governing Boards of Universities and Colleges, chair of the executive committee of the Association of Independent Colleges and Universities in Massachusetts, and a member of the executive committee of the American Council of Education’s board of directors. He has also served as a member of the American Academy of Arts and Sciences’ Lincoln Project, which made the case for strengthening public research universities, whose finances were punished as state governments slashed support in the wake of the financial crisis and recession that began in 2008. These ties throughout academe may prove potent at the present moment (see “The Challenging Context,” below). Richard P. Chait, professor of education emeritus—whose scholarship and advisory practice have focused on higher-education governance, boards of trustees, and leadership—has known Bacow for a couple of decades, and worked with the Tufts board while Bacow was president. He was also an important adviser on the reforms that remade the Harvard Corporation at the end of 2010 (shortly before Bacow became a fellow). Characterizing the president-elect as both a friend and someone he has observed in action, Chait said, “Nobody dislikes [taking] credit more broadly than Larry—he is always explicit in the attribution of credit to others.” In addressing difficult challenges, he said, Bacow demonstrates “a remarkable ability to articulate sensitive, delicate issues with full frankness and no edge”—dealing with controversies over free speech, for instance, “with a refreshing forthrightness” that nonetheless manages not to provoke advocates or instigate hostile reactions. Those traits are deeply rooted in “a person of unimpeachable integrity,” who applies his energies to institutional ends, not personal ones. inspires trust. He is not just smart, but wise. He is innovative and entrepreneurial. He has high academic standards and excellent judgment in people. He has a strong moral compass and extraordinary emotional intelligence. He relates easily to all different kinds of people and motivates them to commit to something larger than just themselves. He is deeply curious—intellectually curious, highly interdisciplinary, and naturally collaborative. He has the confidence to set priorities and to make the hard choices to implement them. He is…all about the institution and the people in the institution, not about himself. He is someone who loves Harvard, but whose love isn’t blind, who is always asking how Harvard can do better, not just for Harvard, but for the wider world. That nod to the the universe beyond Harvard’s footprint in Boston and Cambridge carries a larger significance. Hanging over the discussion of Bacow’s ever-upward higher-education record, and his ready-to-roll preparation for assuming the University presidency, is a pervasive sense that the external environment is threatening—perhaps even uniquely adverse. The emphasis lingered on the last of those desiderata. Underscoring the point, Lee said the ability to assume the presidency seamlessly counted “because neither we nor higher education have time to spare.” He amplified that Bacow acceded to the search committee’s request that he consider becoming a candidate because he felt the present moment was critical for higher education in general and Harvard in particular. Taking education personally. During the news conference, Bacow addressed those issues in a way that began to make the presidency-to-be his own. Drew Faust entered Mass Hall as an historian of the first rank; her default approach in situating Harvard issues and pointing a way forward was to delve into the institution’s history. Bacow’s scholarship, as noted, has focused on negotiating and making policy in complicated circumstances—but his research career has now been succeeded, for two decades, by a second one, as a leader in and thinker about higher education. As he takes up the reins for this ultimate stage of that second career, he chose to frame the stakes in highly personal terms. When I reflect upon my parents’ journey to this country, I realize how lucky I am. Where else can one go, in one generation, from off the boat, with literally nothing, to enjoy the kind of life and opportunity that I and my family have been fortunate to enjoy. It was higher education that made this all possible. I look forward to working every day as president of Harvard to ensure that future generations benefit from the same opportunity my family had—and so many of us that I suspect sit in this room today also had. And that is the opportunity to experience the American dream. These days, higher education has plenty of critics. And candidly, I think some of the criticism is fair. We need to do a better job of controlling our costs. We need to do a better job of operating more efficiently. We need to collaborate with others, with our peer institutions, with industry, and the broader world. And we need to be vigilant to ensure that our campuses are always open to new ideas—that they are places where all our members feel free to express themselves, and also where every member of this community feels that he or she belongs. But the knowns confronting any new Harvard leader are clear enough. The external environment is certainly not propitious. The list of worries includes, inter alia, citizens’ alienation from higher education (its high sticker price and doubts about the return on investment)—and proliferating challenges to the meaning of truth and facts generally; the newly legislated tax on elite institutions’ endowments (in part a vivid reflection of that public mood); threats to federal research funding and support for financial aid; litigation about selective institutions’ admissions policies; and arguments about campuses’ political biases and elitism. As noted, these concerns seem at the forefront of the Corporation’s, and Bacow’s, minds. How to address them? Therein may lie the appeal of Bacow’s compelling personal narrative and the reach of his higher-education contacts list. Defining and leading the debate over the importance of higher education, at this political moment, from this Crimson redoubt, promises to be a demanding, time-consuming effort. At the same time, there are plenty of items on the University’s internal agenda—some of which pertain importantly to how successful it might be in advancing the conversation in the world beyond Greater Boston. The crude way of perceiving such issues is through a financial lens. Yes, the endowment was $37.1 billion at the end of last fiscal year; and yes, The Harvard Campaign will certainly bring in at least $9 billion by its end, on June 30, and perhaps considerably more. But three intersecting trends tell a tale perhaps at odds with that eye-popping headline figure. First, the University has had not one but two financial crises in the past decade. The acute losses associated with the national financial crisis and recession in 2008-2009 decreased Harvard’s net worth, abruptly, by $14 billion. That has been followed by the simmering, but persistent, underperformance of endowment investments in the decade since (over time, a couple of percentage points of annual return less than the 8 percent goal, aggregating to hundreds of millions of dollars per year, and compounding continuously). In toto, that shortfall has constrained the flow of funds that deans expected to be distributed from the endowment into their schools’ budgets for teaching and scholarship. Second, as a result, the endowment is nominally about the same size today as in fiscal 2008 (and billons of dollars less when adjusted for inflation), but it supports operating expenses that have risen from $3.5 billion in fiscal 2008 to $4.9 billion last year. The academic impacts are consequential. Faculty growth has been constrained. Research initiatives have been supported with internal grants, not more permanent funding. High-profile ventures like the University data-sciences initiative and the College’s theater, dance, media concentration are staffed with postdocs and adjunct teachers, not new professorships: a new, flexible model of investing without incurring permanent costs, maybe—or a sign of stretching limited resources. Third, given the depth of the endowment-income shortfalls, the capital campaign—essential to shoring up both the balance sheet and underwriting operations and buildings—could not suffice to fill the gap. “Capital” is a bit of a misnomer: through last June, when the campaign reached $8 billion of gifts and pledges, about $2.3 billion had been received to bolster the endowment. The majority of campaign funds are for nongovernment sponsored research and current use (which are obviously quickly spent), and building projects (House renewal, the Kennedy School campus expansion, the Business School’s new executive-education and conference facilities—most of which permanently increase operating expenses). At Harvard, nearly doubling current-use giving during the campaign has provided invaluable support for the University’s academic mission. But unless sustained at that level, it does not substitute for mission-focused endowments and the operating funds they theoretically provide in perpetuity. In short, Harvard is a big university, expensive to run. The endowment shortfalls are presumably being addressed: Harvard Management Company, under new leadership, is in full tear-down mode. But it may take years to improve results, and the investment environment is not guaranteed to remain effervescent. And in the meantime, of course, there will be decanal vacancies to fill (notably, in the Faculty of Arts and Sciences; see “University People”), perhaps senior administrative searches to conduct, and the myriad activities of simply running the place. That work—together with setting and paying for major Harvard priorities, and attempting to influence the public discourse about higher education—would seem a sufficient presidential to-do list for the next decade or so. In a conversation after the briefing, the president-elect pointed to his recent writings on higher education as a better guide to who he is today than his scholarly work, some decades ago, on negotiation and dispute resolution in the complex realm of environmental decisionmaking and policy. But given the challenges he has now determined to assume again, perhaps that earlier work, from the first stage of his life in higher education, assumes relevance anew. “This is the place where I can do my best work. “This is the place where I can pursue opportunities beyond those that might be available to me anywhere else. I am enormously excited to be part of such an adventure. And for these next several months, I also look forward to being a Harvard student again. I still have much to learn, and I know from my prior life here that there is no better place to learn than at Harvard. Those of us privileged to lead this University are invested with a precious trust. Working together, faculty, staff, students, and the governing boards, I promise to do everything within my power to prove worthy of that trust.